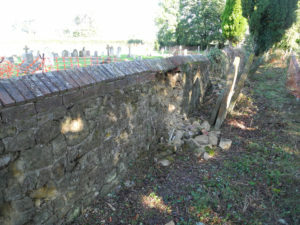 We have recently commenced work on the west boundary wall of the church yard. The appointed stonemason, Shawn Williamson was able to give us some time in September to make a very meaningful start on the wall. If you haven’t seen the impressive work he has done, you should take a walk through the church yard to see for yourself. If not, there are before and after photos attached. As Shawn had some free time we made a start on the wall to show our intent and what can be achieved to restore the lovely handcrafted wall. He has completed approximately 1/3 of the west wall. Money for this month’s work has come from the boundary wall fund. Shawn is proposing to return in November, weather and funds permitting. We have applied to the Capel Parish Council for partial funding and if that comes through we will be able to do a further section of the wall. Further donations from the parish and wider community are needed. Shawn would like to teach local people the art of stone masonry and we would welcome volunteers to come along in November to learn and assist. If you are able to do so please let Liz know. The post Capel church’ boundary wall being rebuild appeared first on The Parish of Capel and Ockley.